Hang them from your ears, spit the pits as far away as you like but — whatever you do — don't get any cherry juice on your clothes! That's right, it's cherry season and these red, round, and juicy fruits are the perfect indulgence — just don't eat them while wearing anything white! All you need to enjoy these little balls of delight is the right recipes. No problemo! We've got it covered, with not one, not two, but three tasty variations. 1. Wash all the cherries, and remove the pits from all of them, except for a handful you'll need for decoration. For taking out the pits, we have a neat little method you can add to your store of kitchen tips and tricks. 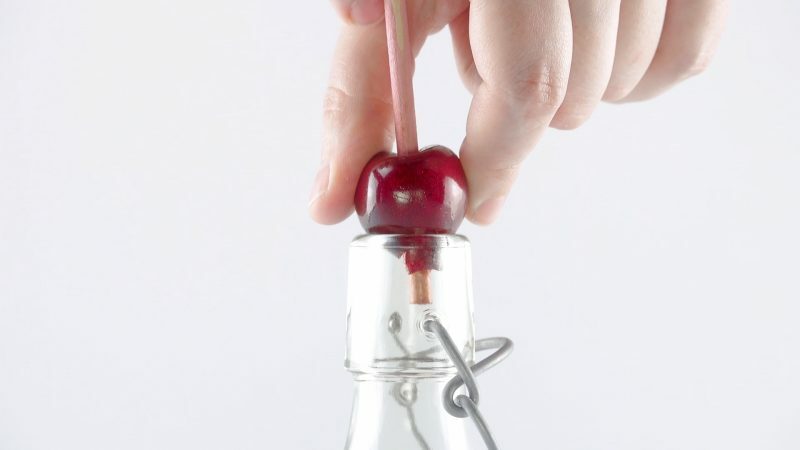 Pull the stems off the cherries, then place the cherries over the opening of a glass bottle. Press the pit out of each fruit using a wooden kebab skewer. The pits will fall and be collected one by one in the bottle. 2. Purée the cherries in a large pan, add the gelling sugar and cook for four minutes while stirring. Pour the jam into preserving jars and seal them tightly. The jam has to cool completely as part of the manufacturing process. For the first variation, cut the puff pastry into six squares. From the edge of each square, make a cut almost to the middle. Put a teaspoon of the jam in the center of each square. 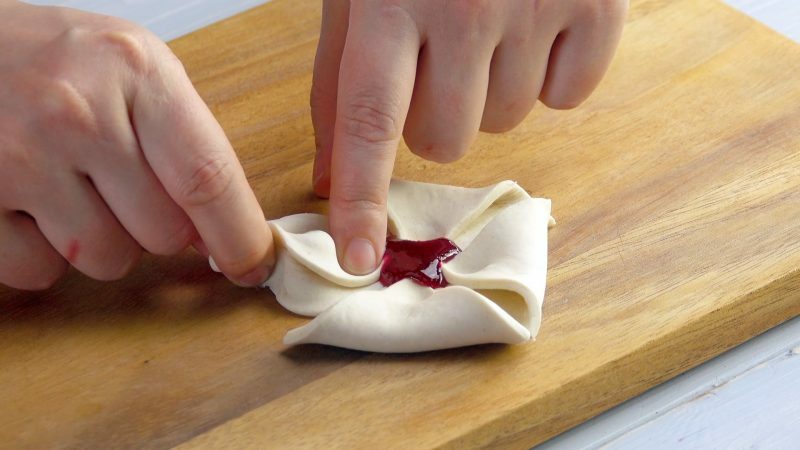 Fold the corners into the middle, then press the pastry near the jam down with a finger. 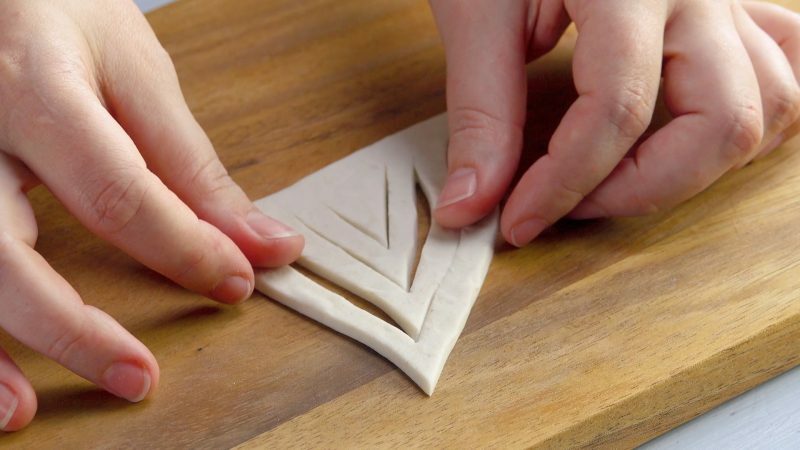 Take the two corners of each fold and pinch them together. The result should look like a flower. Place your blooms on a baking tray lined with baking parchment. Brush them with egg yolk, then place a cherry in the middle of each one for decoration. 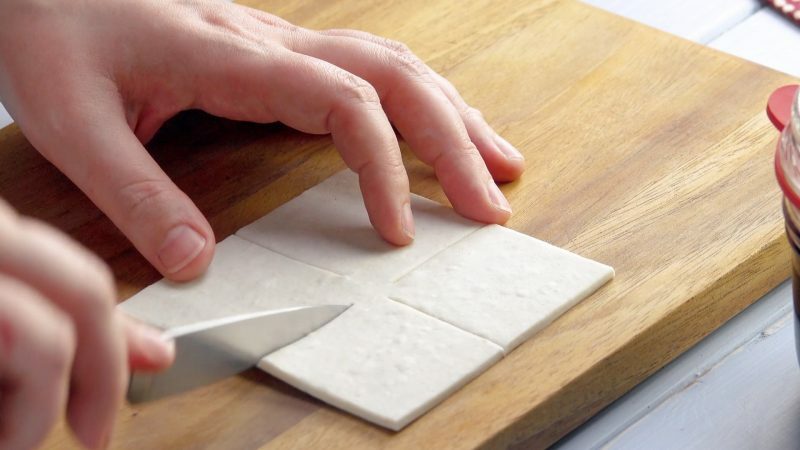 Cut the puff pastry into squares, then cut each square diagonally to form two triangles. Next, in each triangle, cut three incisions parallel to the longest side and another three parallel to one of the shorter sides. The cuts should be evenly spaced, and should join up, as in the photo below. Place a teaspoon of jam and a cherry between the ends of the two shortest cuts. 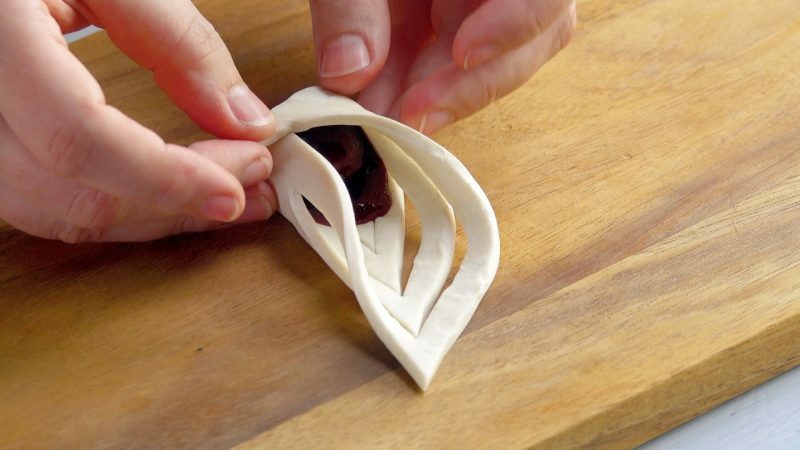 Then wrap up the cherry, by folding the two nearest corners of the pastry triangle over each other. Cut the puff pastry in strips a little under 1 inch wide. 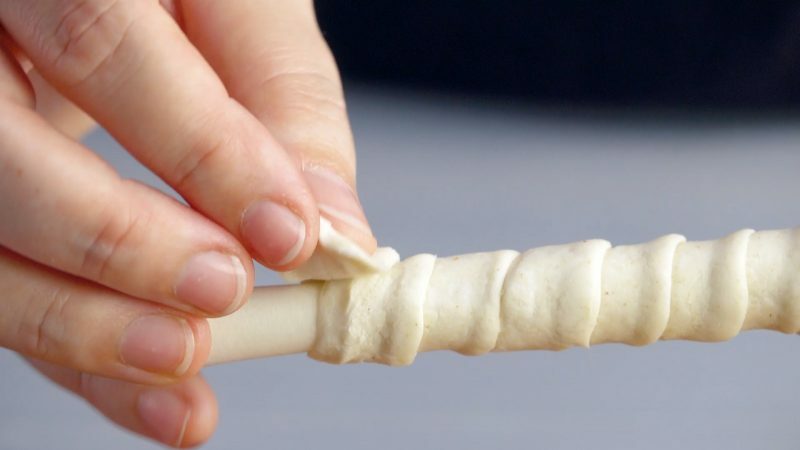 Wrap the strips over pre-prepared rolls of baking parchment, letting them overlap slightly. 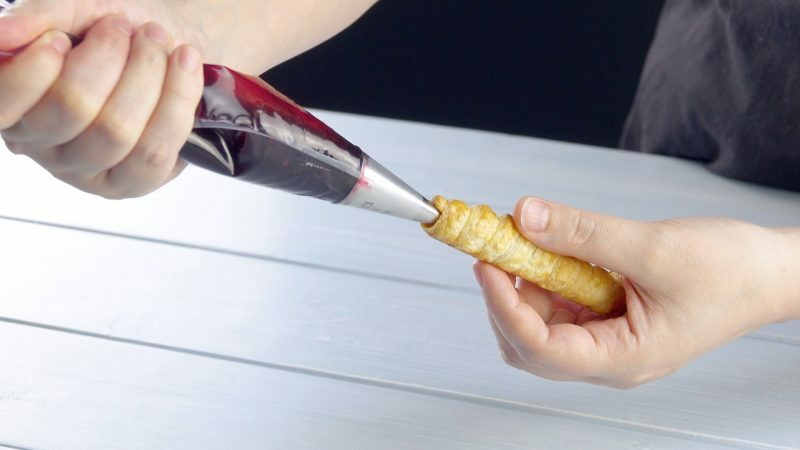 Only remove the paper roll after baking and then use a piping bag with a long spout to fill your pastry spirals with cherry jam. All your pastry creations from each recipe should be baked for 20 minutes at 360°F in an oven with the heat coming from above and below. 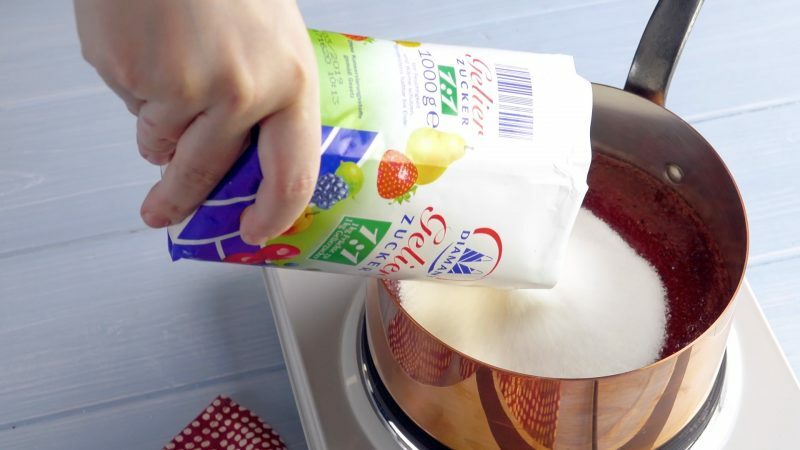 Then once they're done, they can be sprinkled with powdered sugar.